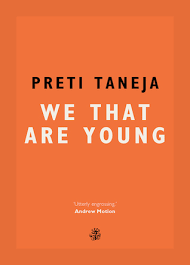 Preti Tanja’s novel We That Are Young is a visceral and energetic retelling of King Lear, set against India’s anti-corruption riots of 2011-12. Taneja is also an academic and human rights advocate, and a co-founder of ERA films, where she has worked on projects addressing Iraq’s refugee crisis, survivors of the Rwandan genocide and women living in slum areas of Nairobi, Kenya. We that are young is 553 pages. There are sentences in it that I am proud of. Some of them? Just three words. Having said that, the book took seven years from idea to publication and there have been some extreme personal and professional situations to contend with during in that time. So I’m proud that the book exists at all. And that (creatively) I’m intact. In 2013 I co-founded Visual Verse (www.visualverse.org) the online anthology of art and words, with Kristen Harrison who runs The Curved House publishing company in Berlin. It refreshes on the first of each month; from a modest start we now get around 200 submissions from all over the world and we publish the most interesting. I’m fiercely proud of, and inspired by those writers. The Visual Verse inbox and the community we’re building make me happy every day. I lost my mother Meera Taneja when I was 28. She was an amazing woman with a huge amount of vision, determination and compassion, a true citizen of the world. She came to the UK in the 1960s then established a career as a cookery writer, published eight books on Indian food, made TV programmes and guest presented Play School. Later, she started a company from our kitchen and grew it into one with a significant turnover, employing over 200 Asian women from a socially depressed part of the UK, many of who had never found paid work before. Under pressure, she was forced to sell. Then she fought her illness for another five years. I cared for her with my family during that time. I was there when she died. I once told my lecturer at journalism school that I would never take a job at a rightwing newspaper. She told me not to be so idealistic if I wanted to work in journalism – and that Rupert Murdoch would die one day. It was 1999. First: Gina Miller – I admire her courage and clarity, her knowledge of financial systems, politics and the law, and her fearlessness in holding those systems to account. I’m assuming the next world (for Pharoahs) is an enormous library of world literature and I can somehow read in the original language, or it is in brilliant translation. So I would take my reading glasses. Also something to write with that would work infinitely in the next world. And a never-ending blank notebook. Jitna hasta hai, utna rota hai – as much as you laugh you’ll cry. It was my grandmother’s fun-killing warning of choice. It only used to make us laugh harder. Posted in Interviews and tagged Preti Taneja, The Momus Quesionnaire. Bookmark the permalink.